In this paper, we propose a power-aware parallel job scheduler assuming DVFS enabled clusters. A CPU frequency assignment algorithm is integrated into the well established EASY backfilling job scheduling policy. Running a job at lower frequency results in a reduction in power dissipation and accordingly in energy consumption. However, lower frequencies introduce a penalty in performance. Our frequency assignment algorithm has two adjustable parameters in order to enable fine grain energy-performance trade-off control. Furthermore, we have done an analysis of HPC system dimension. This paper investigates whether having more DVFS enabled processors for same load can lead to better energy efficiency and performance. Five workload traces from systems in production use with up to 9 216 processors are simulated to evaluate the proposed algorithm and the dimensioning problem. Our approach decreases CPU energy by 7%– 18% on average depending on allowed job performance penalty. Using the power-aware job scheduling for 20% larger system, CPU energy needed to execute same load can be decreased by almost 30% while having same or better job performance. 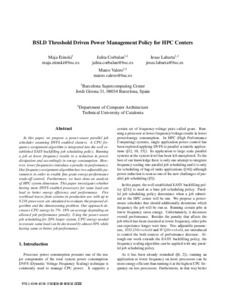 Etinski, M., Corbalán, J., Labarta, J., Valero, M. BSLD threshold driven power management policy for HPC centers. A: IEEE International Parallel and Distributed Processing Symposium. "2010 IEEE International Symposium on Parallel & Distributed Processing, Workshops and Phd Forum (IPDPSW)". Atlanta, Georgia: Institute of Electrical and Electronics Engineers (IEEE), 2010, p. 1-8.